I blogged last week about the Las Vegas plans for the next training event while our training site was still being remodeled for the Las Vegas show. We were thrilled to see that the slight disarray did not keep some dedicated will be attendees from jumping on the great Early Bird deal we put together that included 4 hotel nights. Why are these only good until next Friday, you ask? If you’ve ever done business with these Vegas Hotels, unless you are ready to make hard commitments to take up huge portions of their hotel space, it’s a bit like getting airline ticket prices which change minute to minute. We’ll keep working with them but are at their mercy so for now, take advantage of these rates while we have them and while supplies last for each type. VoIP Experience audio blog going over last month’s event. We released versions 2.4.0 on February 10th after seeing over 1300 very successful beta sites and what appeard to be record stability during the beta program. We also did another first and introduced a “2.3 to 2.4 Upgrade Tool” module to circumvent the need of downloading the new tarball as had always been required in previous major version upgrades. That has resulted in an overnight success as we have seen almost 7000 systems upgraded through this tool. Even more exciting, in just one month we already have over 11,000 2.4.0 installs which sets quite a precedence on adoption rate for a major release. If you’ve been waiting for others to upgrade first and test the waters, this should reassure you that there is no reason hold back any longer! There are a few key area that we would like to put more focus into and there’s just never enough hours in a day to do everything we would like. If you’ve been following some of the activities you have probably heard of Ethan’s early work going on in the voice recognition space around the Company Directory technology which we want to integrate into FreePBX or the Magic Button that has been discussed in various places. Another exciting area is closer integration of XML phone applications into FreePBX since the capabilities and availability of these very promising phones has really matured over the last year or so, and is only getting better. Having such rich applications that expose useful features to end users is a real selling point when competing against the the traditional telco providers. A feature is useless to most end users if there is no button associated with it to provide easy operation. 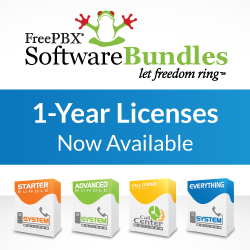 This, and more is what these applications bring us and a closer integration with FreePBX is where we want to drive to. Better End Point Management and Provisioning has been on our list for a long time and we’d like to dust off some of the work that was started last summer and see about revising this and really getting it going. These represent a few important areas that we want to see more focus on. The challenge is finding the time and as many of you know, there is no outside funding or resources other than a few of us dedicated developers and the small contributions that make their way into the project. It is more than a full time job just to run this project and although we manage to bring in some income from sources such as support and professional services and the training program, these very activities take away from the time we would love to be developing the projects just mentioned. One thing that helps take a bit of the edge off is generous donations that are always appreciated.